I cannot remember ever enjoying a thriller so much, despite knowing each element in the plot. In case you came in late on this, Nishikant Kamat’s Drishyam is a remake of the 2013 Malayalam hit of the same name starring Mohanlal, Asha Sarath and Meena. Despite the continuing insistence of members of the film-viewing public and press, Jeethu Joseph – writer and director of the Malayalam film – persists in his claim that he was not inspired by the Japanese bestselling novel The Devotion of Suspect X but by a real-life incident instead. Be that as it may, between 2013 and this week, Jeethu’s Drishyam has been remade in Kannada, Telugu and Tamil; he directed the Tamil version, Papanasam, with Kamal Haasan in the lead; and the Hindi Drishyam credits him for the “original story”. No doubt each critic’s and viewer’s reaction to this film will be governed by whether or not that individual has seen/liked any or all the previous celluloid versions. So FYI right at the start, dear readers, I watched the Malayalam Drishyam back when it was released in theatres, but pointedly avoided the other remakes – especially Papanasam, which was out just this month – for fear of overdosing on the story. I’m glad I did, because I loved the original and did not think it was possible to feel as much for a remake. As it turns out, I do not. 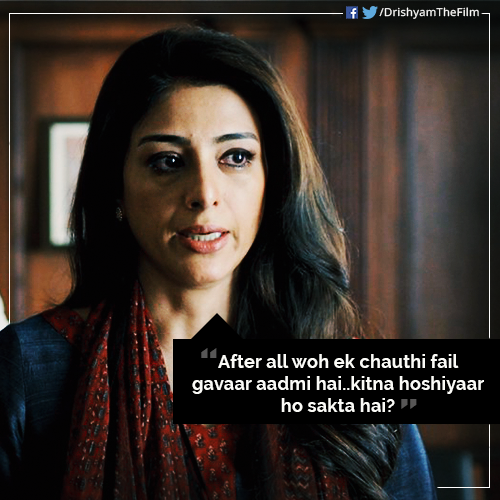 I love the Hindi Drishyam even more. Ajay Devgn here plays Vijay Salgaonkar, a cable TV operator living in rural Goa with his wife Nandini (Shriya Saran) and school-going children, the teenaged Anju (Ishita Dutta) and a much younger Annu (Mrinal Jadhav). They are a regular, traditional family where Dad is the breadwinner and primary decision maker, while Mum takes care of the house. As with many such traditional families, all four are comfortable with this arrangement. Interestingly though, their conservatism pushes boundaries and so, for instance, they have it in them to chuckle when a stray remark about Dad’s amorous ways floats around in the presence of the older child. It is thus established that Vijay The Master Of The House shares an easygoing relationship with the women in his life, that they are a close-knit family, that the kids feel free to confide in their parents and that there is little they will not all do for each other. Vijay is popular among the locals, his only enemy being the corrupt policeman Laxmikant Gaitonde (Kamlesh Sawant). In a parallel universe lives the state’s Inspector General of Police, Meera M. Deshmukh (Tabu), her supportive husband Mahesh (Rajat Kapoor) and their son Sameer. This is a more liberal home where spouses stand shoulder to shoulder every step of the way. Despite their differences over Sameer’s upbringing, it is clear that between Meera and Mahesh too, affections run deep. When these two worlds collide – the world of the middle-class Vijay and the influential Meera – havoc is created and lives nearly destroyed. When a crime is committed, the suspense is not in discovering who is guilty – we know that from the start. The thrill lies in the genius of the cover-up, in how it is revealed bit by bit and in wondering if the truth will ever be found out. This is not a whodunnit or even a howdunnit. It’s a howtheydunnitandwilltheyorwonttheygetawaywithit. 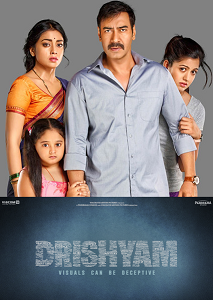 More than just the mystery, what makes Drishyam work is that Jeethu’s story has a heart, and at the centre of it all, six people – flawed, frightened and oh so human – that we begin to care for. Director Nishikant Kamat’s signature leisurely style is crucial here, well-complemented by the serene setting, Avinash Arun’s unflashy camerawork and the unobtrusive music. In fact, the build-up to the crime is so relaxed, that when the deed is done at last, it is designed to sock us in the gut. Everything after that is an adrenaline-infused – yet remarkably still unhurried – journey filled with edge-of-the-seat moments, until that final revelation that had me open-mouthed and wide-eyed in wonder the first time round, and is none the worse for wear a year and a half later. Mohanlal’s Georgekutty was more jovial than Ajay Devgn’s Vijay, as a result of which the gravity of his actions later in the film was in itself one of the twists in that tale. Ajay plays the character in a more stoic fashion, letting a smile only occasionally escape his lips, but for the most part allowing those trademark brooding eyes to do the talking. Whether it was intentional or not, the decision to play the hero differently ends up serving Ajay well since it makes comparisons redundant – after all, Mohanlal at his best is always a hard act to follow. Another big change from the original is that Upendra Sidhaye’s Hindi script – derived from Jeethu’s story – plays down Vijay’s obsession with films. This, unfortunately, diminishes the impact of a significant point about the source of “fourth class fail” Vijay’s wisdom. What makes this Drishyam (even) more interesting than the original though, is the tweaking – both in the casting and writing – of its women and the central man-woman relationship. First, the vast difference in age and trimness levels between Mohanlal and Meena – who played the wife in Malayalam – automatically made her seem more dependent and child-like around him. In the Hindi film, the 14-years-or-so gap between actors Shriya Saran and Ajay Devgn is much less but not minor at all, yet in terms of appearance they seem more like equal partners (despite Shriya’s distractingly over-made-up face). Second, Ajay’s character Vijay is less patriarchal in conversations with and about his wife, Shriya’s Nandini. Third, Nandini gradually comes into her own, at first emotionally reliant on Vijay when tragedy strikes but then growing into a partner: he may be the one with the plan, but she’s no shrinking babe in the woods either. In a film filled with talented artistes, Tabu – who enters near interval time – sinks her greedy acting fangs into a powerful role and ends up towering over the rest. Actress Asha Sarath in the original was wonderful too, but the Hindi script has made the character marginally more likeable. I still think the story is playing to the gallery of prevalent social notions by making the child of a working mother wayward while the good kids are the kids of a stay-at-home Mom, but Tabu’s awe-inspiring performance overshadows even that covert messaging. Her IGP Meera is forever on the verge of exploding but constantly keeping herself in check. It is a performance so contained and yet so much on edge, that I wanted to bow in my seat each time she came on screen. Befittingly then, Drishyam strays from its overall understated tone just once, to give Tabu the kind of introduction scene usually reserved for heroes in mainstream masala films. There’s another remake waiting to be made here. When the memory of this one has faded, how lovely it will be to see, say, Vijay’s wife Nandini working outside the house and – better still – Nandini being the spouse with the brilliant plan through which Vijay supports her as they cross swords with a senior law enforcer/father over a notion of family honour that gets a relook. Now imagine that role reversal with an actress of Tabu’s stature playing Nandini and an actor-star as major as Ajay Devgn in the role of her husband or even the policeman. Imagine. Until then, there is this captivating Drishyam, a unique thriller for parents of sons and daughters, for those with a point of view on stalking, voyeurism, police high-handedness, the nature of life in small towns, definitions of self-defence and the power of the visual. Neat job, Nishikant!